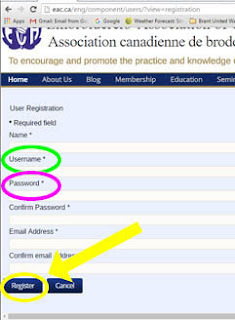 With the new website, we have a system that allows every member to set up a personal "member's only" account. You choose your own user name and password! Starting from the "home" page on the EAC website find the "Create an account" link. Click on the "Create an account" link on the right hand side of the screen, it's just below the dark blue "Log In" button. In the screenshot provided, it is indicated with a red arrow. Once you click on the "Create Account" button a new page will open, titled "User Registration." Enter your first and last name in the first box. Think of a username and a password that you'll use to sign into the Member's Only area from now on. It should be unique to you and something you can remember. Confirm your password by entering it again. Enter your email address and confirm it by entering it again. A confirmation email will be sent to that email address once your account has been approved. Your request will be sent to the EAC Web Team for approval. You'll receive an email notice with your approval pretty quickly - usually within a day. 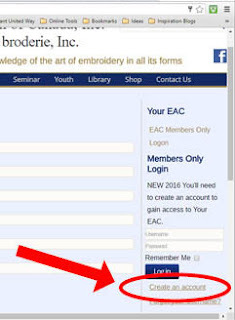 Please note that the username and password are not used for any other purposes within EAC. If you write them down to remember them, there is no way for people to use them to access any personal information you've provided to EAC.